It’s been an extremely fulfilling year working with the Block Museum of Art to provide access to numerous films from CFA’s Mort and Millie Goldsholl Collection that are the centerpiece of the exhibition Up is Down: Mid-century Experiments in Advertising and Film at the Goldsholl Studio. Up Is Down is the first major exhibition to explore the trailblazing work of mid-twentieth century artists/designers/filmmakers Morton and Millie Goldsholl (Morton, 1911–1995; Millie 1920–2012) and their Chicago-area advertising firm, Goldsholl Design Associates. In the 1950s, Chicago-based design firm Goldsholl and Associates made a name for itself with innovative “designs-in-film.” Headed by Morton and Millie Goldsholl, the studio produced television spots, films, trademarks, corporate identities, and print advertisements for international corporations like Kimberly-Clark, Motorola, and 7-Up. Although they were compared to some of the most celebrated design firms of the day, the Goldsholls and their designers are relatively unknown today. Opening in September 2018, the Block Museum’s exhibition Up is Down: Mid-Century Experimentation in Advertising and Film at the Goldsholl Studio will reexamine the innovative work of Goldsholl and Associates and its national impact. The Goldsholls attended Chicago’s Institute of Design (ID) and were inspired by ID’s founder, the artist and designer László Moholy-Nagy. 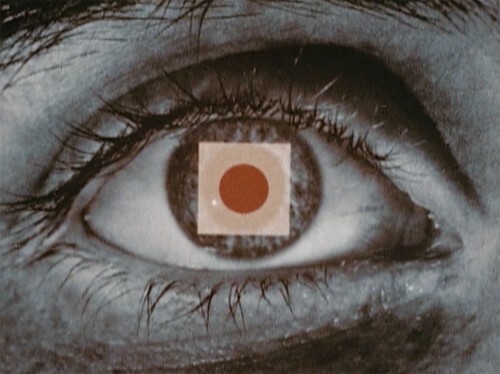 The curriculum at ID included motion picture production, which Moholy-Nagy viewed as a medium of light and collage. Deeply influenced by Moholy-Nagy’s teachings and Bauhaus approach, with its ethos of aesthetic experimentation and social engagement, Morton and Millie fostered a similar attitude among designers working in their firm. Their work in film grew equally out of the unique moving image and design culture of Chicago. At midcentury, Chicago was known as the “Hollywood” for educational film production, churning out thousands of educational and promotional films each year. Filmmakers worked expansively—producing slide shows, short films, and spectacular industry installations, in addition to print advertising and other ephemera. The creative work these artists pursued often influenced their commercial productions and vice versa. Featuring films, television ads, and other kinds of moving images alongside designed objects, print advertisements, trademarks, photographs, and drawings, Up is Down will be the first exhibition to illuminate the distinctive brand of motion pictures that Chicago became known for in mid-century and the ways the city served as an influential testing ground for ideas connecting art, industry, design, and film. The exhibition, its related publication, and public programs will provide context for understanding Chicago as a unique site for ideas connecting art, design, and film that eventually gained international currency. Up Is Down is curated at the Block Museum of Art by Amy Beste PhD, Director of Public Programs at the School of the Art Institute of Chicago (and CFA Board Member), and Corinne Granof, PhD, Curator at Block Museum of Art, Northwestern University.